The first First Person Shooter (FPS) I played was Left 4 Dead. But because my computer then was a steaming pile of crap, it took me literally 45 minutes with a frame rate of under 10 frames per second (also FPS) to inch my way across the first level of No Mercy. Amazingly, I did it first time, but I made it to the safe room with a miserable 10 health. Eventually, though, I got there. I made it into Team Fortress 2. 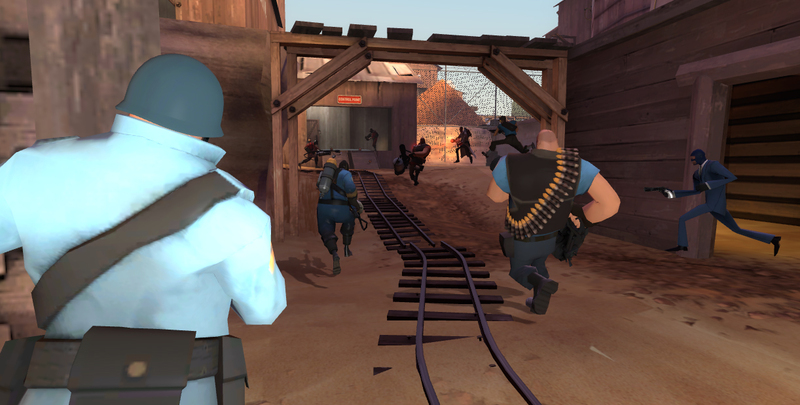 And of course, I did the Soldier tutorial first, back in the day where there was only one tutorial. I’d watched people playing TF2 and it didn’t seem that hard, but as I had very little experience moving around in a faster paced environment, even the beginner bots from the tutorial seemed like expert players. I quickly realized that, even with the tutorial’s help, I HAD NO IDEA WHAT I WAS DOING. And with so much pain coming from so many directions, I’d jump out of my seat all the time. So, because of my first, terrifying experiences, I’ve decided to offer a few tips for those who might be taking their first steps into the world of TF2. Tip the First: W is to move forward, S goes backwards, A and D go left and right. Space to jump, Ctrl to crouch, Left Click to fire. Move your mouse to aim. Make sure you can reach all these buttons comfortably before you start playing. There’s always the option to change what button does what in the Options menu. Tip the Second: Take the time to play in Offline Mode, or in empty servers so you can learn a bit about the maps. Just so you know where you’re going. My first achievement was Running the Pennant because I got lost on Goldrush. Tip the Third: Aiming is hard. Spend some time running around and aiming at the same time. Tip the Fourth: No one ever explained to me what a Spy did until I was killed by one. They like to stab you from behind and pretend they’re people on your team. If you can’t walk through it, then shoot it, even if it’s wearing the same colours as you. Tip the Fifth: Follow your team mates. They know what they’re doing. Tip the Sixth: This is the big one. ASK QUESTIONS. Your team mates will almost always be willing to answer any queries you have. The enemy team might help too, if they’re nice. Even if you lose the round, at least you’ll have learned something. The most important thing of all though is to have fun. Lots and lots of fun. Yes, getting into a new game can be very tricky at first, but you’ll get the hang of it.